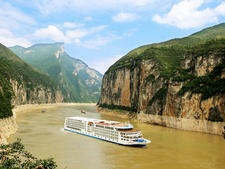 The 196-cabin Century Legend is one of the most modern vessels on China's Yangtze River and is one of Century Cruises seven-strong fleet. There are 32 Deluxe cabins on the Upper Deck (Deck 3), and the most cabins -- 66 in total -- are on the Promenade Deck (Deck 4), comprising Deluxe, Junior Suites and the two Presidential Suites, situated forward with wraparound balconies, a table, two chairs and two loungers. The Bridge Deck (Deck 5) has 64 cabins, made up of 62 Deluxe and two Junior Suites, and there are 23 Executive Suites on the Observation Deck (Deck 6). The 11 other Executive Suites are on the Sun Deck (Deck 7).